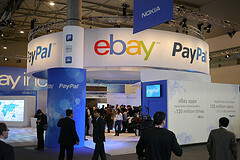 eBay Minus PayPal Equals PayPal Squared? The world of payments and e-commerce is getting exciting. Back in May, Mondato Insight had a look at the (then) impending Alibaba IPO, which last month flooded the coffers of the Chinese internet behemoth with US$25 billion. In July, it was Amazon’s “relentless” move into payments that came under the Mondato spotlight, while in August we took a look at the looming payments battle between Facebook and Rakuten (via their messaging app acquisitions WhatsApp and Viber respectively). And, of course, few could have failed to miss the buzz that was generated by Apple’s dive into payments, with hopes heightened that this, at last, was going to be the “game-changer” that the mobile payments industry has been waiting for. This month, it is PayPal, or rather its owner, eBay, that has shaken up the industry with its announcement the two are to be split into separate companies. The September 30th announcement came as a shock to many, for it is only 6 months since the eBay board rejected a call from Icahn Investments’ CEO, Carl Icahn, to do just that. Interestingly, eBay is now charting the same course that Alibaba did just a few years ago. In somewhat controversial circumstances that set up an entanglement with major shareholders (Yahoo in particular), in 2011 the glue that holds the Alibaba e-commerce empire together, Alipay, was split off from the parent company and sold to a holding company controlled by Alibaba CEO Jack Ma. The question now being asked is who is going to end up controlling PayPal, or, for that matter, eBay? The reasons for the eBay board’s volte-face are not difficult to discern: the facts (i.e. the external environment) have changed considerably from just six months ago, and consequently the Board changed its mind from its March 20th statement that a “full separation of PayPal is not a good idea.” The announcement also comes almost exactly a year after PayPal’s then President (and current chief of Facebook Messenger), David Marcus, announced PayPal’s acquisition of the Chicago-based payments start-up Braintree, which is responsible for the “magic” frictionless payments in apps such as Uber and Hotel Tonight. Furthermore, the success of Braintree’s money transfer app that is taking millennials by storm, Venmo, along with plaudits for Braintree’s slick design and UX has resulted in what one commentator has called a “reverse takeover” of PayPal by Braintree. Despite Square’s promotional videos encouraging consumers to tell their friends to “Just Cash me the money!”, and Square Cash being touted as a potential “game-changer” (even by Mondato Insight), college kids today are much more likely to ask “Do you Venmo?” It is noteworthy, in this context, that it was reported this week that PayPal and Square are in initial talks about a possible buy-out by PayPal of the company that changed every smartphone into an mPOS. If the acquisition of Square by PayPal goes ahead, it is likely to be concluded before PayPal is spun off on its own in 9 months’ time. PayPal will likely have to pay a little more than US$6 billion for Jack Dorsey’s genuinely disruptive, but very low margin and low cash reserves, payments business. Square CEO Dorsey issued a one-word denial on Twitter, similar to denials in April when reports of discussions with Apple and Google emerged. Given the eBay CEO’s sentiments, Square looks like a logical purchase (price-tag notwithstanding) for what will soon be PayPal Inc. Apple Pay and the further proliferation of iPad mPOS holds out an opportunity for growth for Square, in both its core dongle business, and perhaps even the resurrection of its Wallet offering, which may well have been a product before its time. Although much analysis of the failure of Square Wallet has often focused on the lack of value for the consumer, as has been noted elsewhere, reviews of the UX were extremely positive. Square Wallet’s real failure lay in its inability to catch on with merchants, bringing us back to the old chicken-and-egg scenario that bedevils the adoption of new payment technologies. And while it is thought that new PayPal CEO Dan Schulman is exploring a number of potential acquisitions, a question at the forefront of many analysts’ minds over the past two weeks has been whether PayPal, or even eBay, will end up being acquired themselves after the two have split. Alibaba, flush with cash after its IPO and armed with its own payments division in Alipay, could well be interested in eBay’s marketplace. Other analysts see the move as a defense against Alibaba. Japanese e-commerce giant Rakuten already has a toehold in the United States, and eBay could be an attractive offering for it to dramatically enlarge its footprint. PayPal, and with it Braintree, could also be of interest to Rakuten as it seeks to develop payments capacity within its messaging app, Viber. Facebook may be interested in Braintree with similar motives, and as Mondato Insight noted a few months ago, it probably only has one more bite at the cherry to get payments right, which is why it is likely to take its time. Google Wallet’s failure to achieve scale means that the world’s favorite internet search engine will certainly give thought to whether its ends can be met through the acquisition of a brand whose name is almost a by-word for e-payments. And then, of course, there is Amex, currently a bit-player in MFS, but also Dan Schulman’s previous employer. The payments industry is going through a rapid, verging on chaotic, period of change. Upstart start-ups, hefty foreign competition, mergers and acquisitions, carve-ups, the emergence of new technologies and the re-emergence of old ones are all playing their part in an environment where consumer and merchant adoption remains challenging. “It’s clear that the market for commerce and the market for payments is going through accelerating change and the competitive environment is changing at a very fast and exciting rate”, was the assessment of John Donahoe. Whether you believe that separating PayPal from eBay is a stroke of genius or an enormous blunder, there is not much arguing with that.